The Goa property market has seen a marked development over the last couple of years. There has been an ever-increasing demand for residential properties in Goa that includes apartments, flats, villas, bungalows, duplex units and plots. Besides the regular developer properties, Goa real estate also offers a wide range of resale properties. Resale properties in Goa include under construction or ready to move apartments, flats, villas & bungalows ranging from studio apartments to villas in some of the key locations of Goa like Benaulim, Colva, Varca, Vasco, Nuevem, Cavelossim and others. Axiom Estates offers the best resale properties in Goa, with home options encompassing flats, row houses, villas or bungalows, ensuring that you can make the most out of your buy, whether for self use or as an investment option. 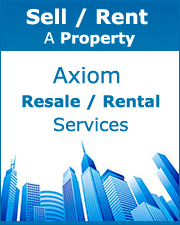 Axiom also helps you to sell your property by listing your property in its own website, while expert in-house property advisors take care of your unit, so that you get the best deal out of it. Thanks for showing your interest in Goa. Please register in the form below and our sales team will contact you shortly. Copyright 2012 Axiom Estates. All rights reserved.